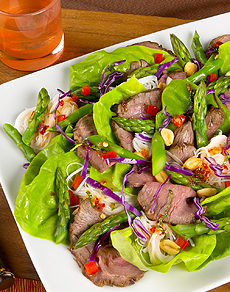 Thai Grilled Lamb & Asparagus Salad makes a hearty, healthy and delicious lunch. Photo courtesy California Asparagus Commission. Americans have not mastered the art of blending meats and vegetables into delicious salads. Take a tip from the Thais and make this wonderful lamb salad. Think of it for leftover lamb, and for serving in smaller portions for a first course with a lighter entrée—pasta, for example. This is Page 7 of a 12-page article. Jump to the recipe below. Click the black links below to view the other pages. For the lamb, blend together the ingredients for the marinade in a small bowl. Marinate lamb for at least 1 hour to overnight. Remove lamb from marinade. Salt and pepper lamb on all sides. Brown lamb on all sides over a pre-heated grill. Finish in a 400°F oven for 20 minutes, or until the internal temperature reaches 140°F. Let lamb rest for 10 minutes before slicing thin. For the salad, blanche the asparagus in boiling salted water until tender. Shock in a bowl of cold ice water to chill. Drain on paper towels. Cook rice noodles as directed on package. Rinse in cold water to chill. Toss with a few tablespoons peanut oil to keep from sticking. For the dressing, place all dressing ingredients in a jar with a tight-fitting lid. Shake well to blend. To assemble, place 1 butter lettuce leaf on a plate. Add a small nest of noodles; top with purple cabbage and red bell pepper. Top with approximately 6 spears of asparagus. Add thinly sliced, room temperature lamb. Garnish with chopped peanuts and fresh mint. Drizzle with the dressing.